Read here about a brandname that resembles the word, tensegrity. Tensairity* is the trade name for a pneumatic beam by the swiss company Airlight. A tensarity beam is a synergetic combination of a air filled flexible tube, cables and rods gives with low pressure a very light but strong structure element. Tensairity is not really a tensegrity technology, it is more a pneumatic or tensile structural innovation. However, given tensegrity's close relationship with pneumatics and tensile structures, it is included here. Read here details of how tensairity beams have structural integrity, and how it relates to tensegrity structural concepts in general. In a Tensairity, air pressure is independent of the span and slenderness of the constituting elements. In other words, Tensairity allows the construction of very light roof structures with extremely long span. 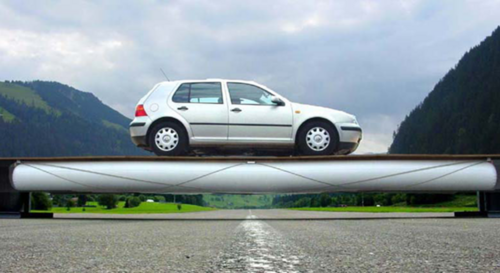 One Tensairity beam, with a pressure of 200 mbar, can support a bridge suitable for heavy transport. Compared with traditional airbeams, Tensairity needs just 1% of air pressure. With such low pressure, air losses are easily compensated. Tensairity Pneumatic Beam supporting a car." This page was last edited on 10 January 2019, at 07:53.